It was our second Sunday in a row for an all-pack walk, so we thought we would mix things up a little and try a different spot than normal. This area is along the Missouri River, south of Plattsmouth, Nebraska. Even though the road we were walking on is a good 1/2 to 3/4 of a mile from the Missouri (when it is cooperating with channelization) the area was completely submerged in about a foot or more of water all last summer. So, even though we are in a drought this year and the vegetation is shorter than normal in most other places, due to the remnant moisture in the soil, the cover was 4-8 feet tall. About a half hour or so later, Charles turned back up, sounding rather disgusted. “Is BB with you?” he queried. She wasn’t. He hadn’t seen her since before he reached the river. Given the fact that she ranges farther than the other three dogs and that it was pretty warm (probably 85, not heatwave hot), he thought that she had jumped in the river and gotten sucked downstream in the strong current. My gut told me otherwise. I’ve seen BB go for a long time without drinking and she is way more into running than swimming. She’ll get out in the water if there is something to retrieve or if there are people or other dogs out, but I just couldn’t see her navigating the steep bank of the Missouri into the swiftly moving river. Standing in the tall vegetation, we called and called and whistled for BB. I kept the other three dogs and the kids at our spot in the shade, calling and whistling from where we were while Charles headed back down to the river calling for her. 20-30 minutes of calling and searching. The vegetation was working against us and absorbing our noise. We ran out of water and since we’d been in the field for over 2 hours and it was another mile hike back to the truck (which takes about 30 minutes with the kids), it was time to move. We were hoping that maybe BB was back at the truck, but otherwise we’d replenish our water supplies and continue our search. It was only 3 PM and we had another 6 hours until dark. Caleb fell behind and wanted to take a break, playing in the dirt on the road next to a soybean field. As the soybeans are only shin high and it was about a 20 acre field, I thought that this was probably my one chance to have my voice project and echo off of the nearby valley hills to the west. I spent a good 5 to 10 minutes calling her name to the sky and whistling. Looking back at Caleb playing in the dirt, I swore I saw a little reddish brown fur pop around the bend of the soybean field. I ran over and thank God it was BB! At first she was happy to see me, but then she got really “low dog” with her tail between her legs. She knew she had been bad, meaning that most likely she got onto and chased a deer. Every one of our dogs has had the experience as an older pup/younger dog of being overpowered by prey drive and the desire to run, chasing a deer, getting lost for a few hours, but then pulling their wits together and finding the pack. It scares everyone, but is an important learning experience for the dog to keep checking back with the people. 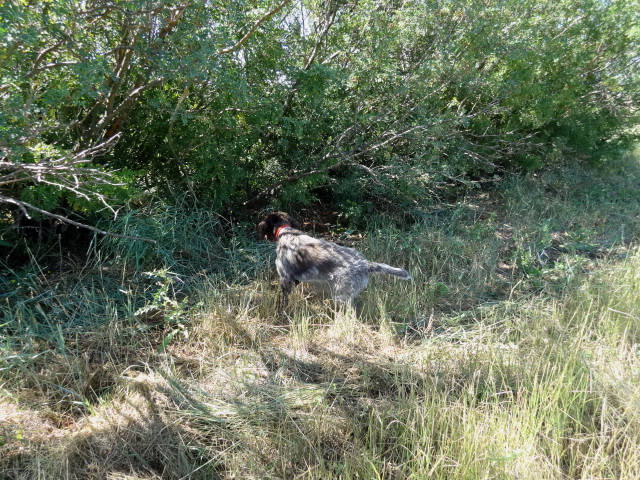 This is an essential skill to keep Wirehaired Pointing Griffons as foot-hunting dogs and not just another out-of-control field trialing breed. 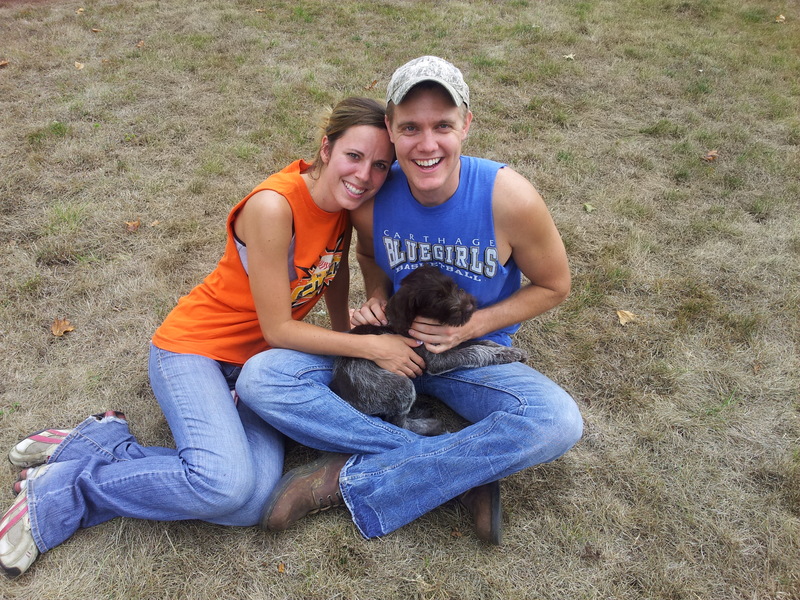 It felt good to be heading home together with all four Wirehaired Pointing Griffons we arrived with! On the ride home, I found out that not only did BB have a misadventure, but when Charles came up on the Missouri, Sam piled in and swam about a third of the way out into the main channel, then realizing he needed to get back, tried to swim against the current to make his way back to shore, but was no match to the Mighty Mo. Sam was sucked around a bend where Charles couldn’t see him. The frightened owner ran the bank around the bend, calling for the dog. The echo off of the other bank was confusing the dog, thinking that his boss was on the opposite bank. Luckily Charles had Conrad’s blaze orange shirt in his hand, so he began waving Sam into the approaching wing dam. Sam successfully made it to the calm upstream from the wing dam and climbed the rocks out of the churning channel. That particular area is a bit too wild for all of us. 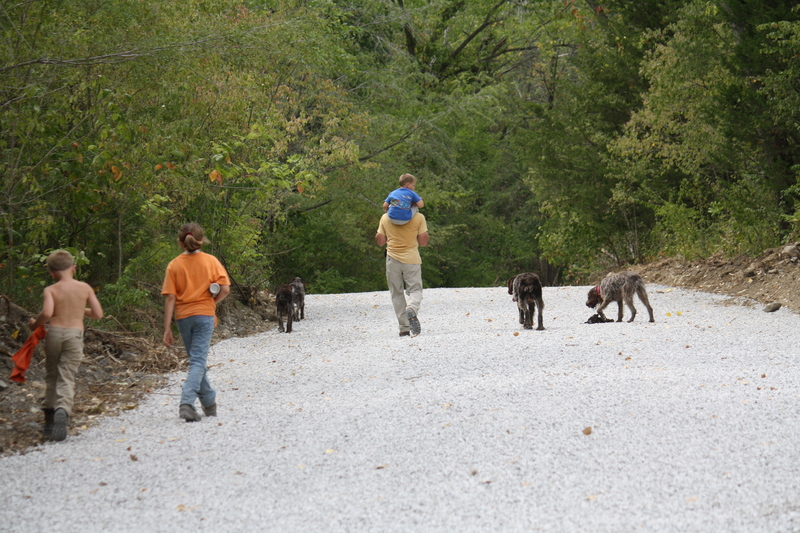 Maybe Charles with one dog can handle its peril, but the pack will stick to our usual spots. Sixteen more days until opening day of hunting season for us! I plan on getting some videos made showing my grooming techniques this weekend to post for next week’s check-in, then it will be time to shift gears into the next phase of my writing year. Thanks for coming along!